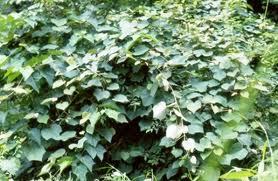 Synonyms: Vitis cordifolia, Vitis henneana, Vitis rugosa, Cissus vitiginea. Indian names: bhambay, Mehdu (Himachal Pradesh); asajiya, asoja, paharphuta, purain (Kumaon); kolo, kolo nari (Santal). Bhambay is found throughout the sub-Himalayan tract, ascending up to 1,500 metres from Hazara eastwards up to Burma. In Himachal Pradesh it is found up to the elevation of 1,500 metres. This species is very common in the forests lying between Kalka and Dharampur. A large woody deciduous climber, with long and forked tendrils; vines climbing on trees in forests going even up to the height of 25 metres and covering the entire canopy of the tree; bark, brown to blackish. Leaves, simple, 13.2 cm long, 15.3 cm wide, with 7.2 cm long petioles; both branches and leaves tomentose; tomentum, less on branches and the dorsal surface of the leaves; ventral leaf covered with very dense tomentum which is Nasturtium orange 610/2; tendrils, opposite to the leaves and generally bifurcated once or twice. Flowers, bisexual, regular, green, ebracteate, pedicellate (pedicel, 2 to 3 mm long), complete, hypogynous, regular, pentamerous, 3 mm long; inflorescence, a corymbose raceme, each having 841 flowers; calyx, small, cup-shaped, 5-lobed, green, gamosepalous; corolla, gamopetalous, with 4 to 5 petals, calyptra type, calyptra failing off at the time of anthesis, actinomorphic, about 2 mm long; androecium, polyandrous, with 4 to 5 stamens, basifixed, bithecus and 2 to 3 cm long; gynoecium, with a short simple style, having a single terminal stigma; style, 2 to 3 mm long. Fruits almost round, 1.1 cm in diameter; weight, 461 mg; volume, 375 microlitres; pedicel, 9 mm long; fruit colour royal purple 834; pulp, spinach green 0960/3; number of berries per cluster, 61. Seeds, greenish, 7 mm long, 4 mm in diameter; weight, 63 mg; volume, 61 microlitres; seeds per berry, 1 to 6. Bhambay vines growing in Sanwara, at an elevation of 1,369 metres above the mean sea-level, were observed to flower from the 1st week of May up to the third week of May. The fruits started ripening in July and continued to do so till the middle of August. 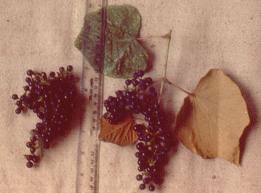 An average-sized vine of this wild grape yields up to 18.5 kg of fruit. These fruits contain 51.6 per cent extractable juice and have 72.7 per cent moisture. The total soluble solids are 16.8 per cent. The fruit juice contains 2.38 per cent acidity, 13.02 per cent total sugars, 11.92 per cent reducing sugars and 1.04 per cent non-reducing sugars. The vitamin C content is, however, not much and it was found to be 2.09 mg per 100 ml of juice. The protein content of the fruits is 1.03 per cent. The percentage of different elements in the edible portion, viz. phosphorus, potassium, calcium, magnesium and iron is 0.043, 0.109, 0.131, 0.092 and 0.005 respectively. The ash content of the whole fruit is 2.211 per cent. The fruits are sweet, with a blend of acid in them. They are, however, slightly sourer than the cultivated grapes. The overall fruit quality is good. Bhambay is found in abundance in the forests of mid-hills of Himachal Pradesh. As it is evident from the chemical composition of the fruit, it contains a high proportion of extractable juice which is rich in sugars and other soluble solids. The juice of this fruit should make a good wine and efforts should be made in this direction. Some remarkable features of this fruit are that, unlike the cultivated grapes, there is no cracking of berries because of rains, and no incidence of diseases, such as mildew or anthracnose, which are very serious and common on the vinifera grapes during the rainy season. Use should be made of these characters of this species in the hybridization programs to evolve some new varieties more suited to the hilly region.